Aside from that day Uncle Wendell almost drowned in the manure pit, there is no more exciting time on a family farm than the county fair. There are hides to be washed, coats to be trimmed, equipment to locate--and then after the kids are ready, we have to start preparing the animals. This year, once again, our family is packing up an extensive collection of entries, including 10 amateur photos, 9 decorated cupcakes, 8 crossbred pigs, 7 types of snacks, six geese a laying (not really), FIVE CHANGES OF CLOTHES, four cases of pop, three 4-H posters, two dairy heifers and one scarecrow dressed like a post man. Whew. 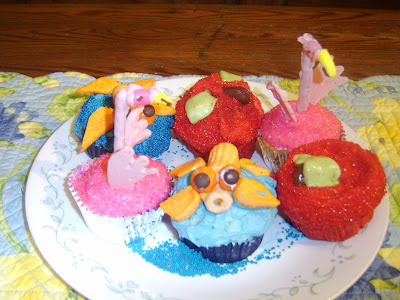 Take a sneak peek above at our decorated cupcakes (flamingo, gold fish and apples). We did a trial run last week and discovered that pink melting wafers a) don't really taste that good and b) cook rather than melt in the microwave. We also expect that since I had trouble finding them, by the law of motherhood, every store I visit for the next year will be selling circus peanuts. We will be posting photos and official ribbon counts as the week progresses. If you're in the mood to join us, please visit http://www.montcofair.com/ for the full schedule. We'll be there all week! The cupcakes are so cute! What did you use for the flamingo's necks? That's a good idea. I'll have to check out the book.